Winter Hours: Open Daily 7:30am-5pm (drive thru open at 6:30am). Serving Breakfast 7:30-11am & Lunch 11am-3pm. Winter Hours: Open Tuesday – Sunday at 4pm. Serving Dinner. Winter Hours: Monday – Saturday 10am-3pm. Closed Sundays. Winter Hours: Monday – Wednesday 8am-6pm; Thursday & Friday 8am-7pm; Saturday 7:30am-7pm; Sunday 7:30am-6pm. Winter Hours: Sunday – Thursday 11am-Midnight; Friday & Saturday 11am-2am. Winter Hours: Wednesday – Sunday 11am-3pm Lunch; W/Th/Sn 5pm-8pm Dinner and Friday & Saturday 5pm-9pm Dinner. Winter Hours: M/T/Th/F from 5am-6pm, dining room closes at 5pm; Wednesday 5am-7pm, Pizza night 3-7pm! Saturday 5am-3pm; Sunday 7am-2pm. Winter Hours: Friday & Saturday 11am-10pm; Sunday & Monday 11am-9pm. Closed T-Th. Winter Hours: Sunday–Thursday 11am-9pm; Friday & Saturday 11am-10pm. Winter Hours: Breakfast served daily 7:30am-2:30pm; Lunch daily 12-2:30pm; Candlelight Dinner Served Saturday – Thursday, 5-8pm. Reservations Required for all evening meals. Winter Hours: Thursday, Friday & Saturday from 5-10pm. 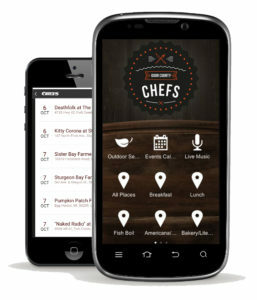 Find all these restaurants and more with the Open for Winter category on the Door County Chefs Mobile Dining App – FREE for iPhone and Android with click-to-call phone numbers and GPS directions, plus DC Chefs Member menus! Find festivals, live music, theatre and more on the Peninsula with the Door County Events Calendar, accessible from the DC Chefs App! Use the FREE Concierge Service to find a great room! Follow DC Lodging on Facebook to hear about lodging specials, available rooms, and last minute cancellations!